One of Nintendo’s greatest successes of last generation was Wii Sports. 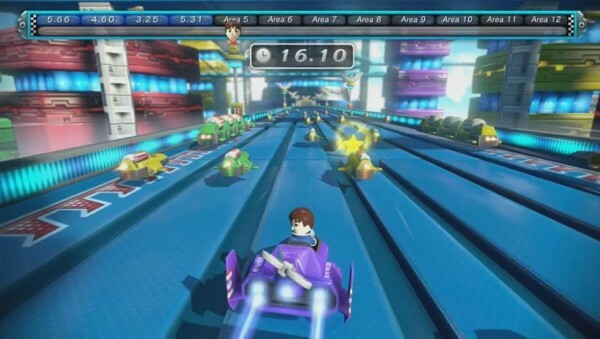 Yeah, it was just a simple compilation of mini-games, but each showed off what the Wii could do in terms of motion control – and lets face it, those little games are still ideal to whip out when company comes over due to their simple yet fun nature. With the Wii U, Nintendo had to have a successor to the franchise. 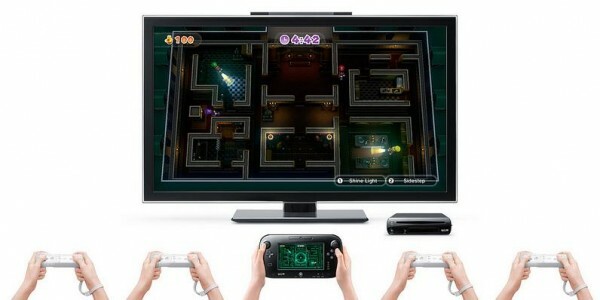 Nintendo Land is that game that serves the role of introducing new Wii U owners to the Gamepad, as well as the entire console in general. Instead of just using Miis and unknown characters, this compilation embodies the essence of Mario, Zelda, Metroid, and several other massive franchises – which have all been glued together into one fantasy theme park that is able to be explored and somewhat customized. Is Nintendo Land the dream resort for fans, or does this launch title prove to be one locale worth skipping? Let’s find out? This shouldn’t come off as a shock, but Nintendo Land has no story really to speak of as a whole product. Once booted, players are introduced to Monita, who serves the role as your robot hostess. Monita also plays the role of AI for certain multiplayer titles when playing on solo, and even as some of the bosses for the more adventure styled romps on the disc. She’s no Mario, but her dry humor is sure to offer a chuckle from time to time, if players can handle that whiny and nasally voice. There are twelve games in all within Nintendo Land, with each being distinctly different from the next. We will get to those in just a moment, but I feel I should show some appreciation to the little hub area that acts as the theme park itself. Every attraction can be accessed right from the start, but instead of accessing each through a menu (which is an option), Nintendo went out of their way to attempt to embody that whole theme park vibe. Your Mii can explore the area via the Gamepad, scamping from game to game on foot. It sounds like standard fare, but even this is a slight tutorial for what me may see on the Wii U down the line, as the controller acts as your camera and can be lifted and moved around to let you get a better view of your surroundings. Thankfully, this works well enough and makes it feel as if you are actually visiting a booming theme park where every ride begs you to participate, making Nintendo Land feel bigger than it actually is. Of course that is just a light touch, as the games themselves are the reason to become a guest. Most would assume that all twelve romps would just be mini-games, but that is inaccurate to a degree. Every attraction feels like a full game that we would see released on the eShop and while they are small, they still have enough content to provide hours of gameplay if one can cling to the concept. Mario Chase is one of the finest examples I could use to explain this, so we’ll just start there. 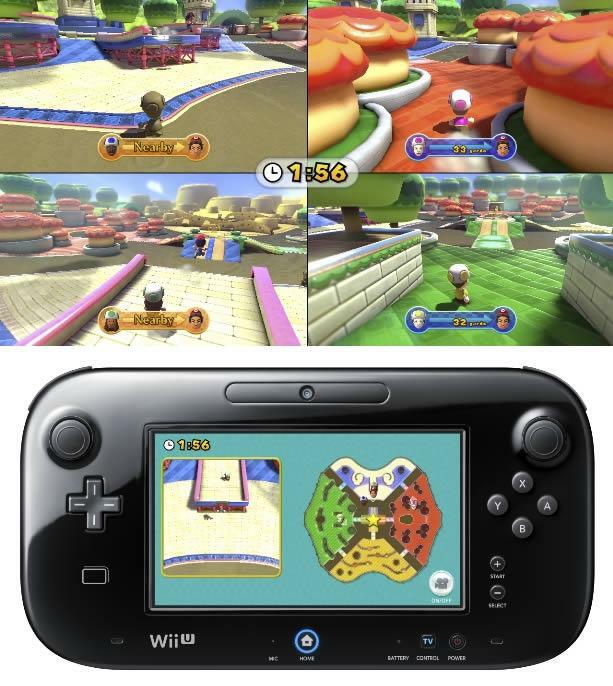 In Mario Chase, one player takes the role of Mario with the Gamepad, while all other WiiMote users are assigned Toads. Remember those childhood days of tag? Well, that is really the only objective behind the game. After getting a ten second head start, Mario must outrun and outsmart all of the Toads on a stage, while the Toads try to hunt down and tackle the mascot (which is your Mii in Mario attire, for those wondering) before the timer ticks down to zero. The user that has the Gamepad will be able to see the entire map and the Toad’s locations in their HUD on the right side of the screen, while the left portion is utilized to display Mario’s own perspective. On the television, players who are chasing get no map, but instead must use audible hints from Monita to located the mustached warrior. If only one other player is participating, two Yoshi’s will offer assistance and smack Mario with their tongues to give the lonesome toad an advantage. 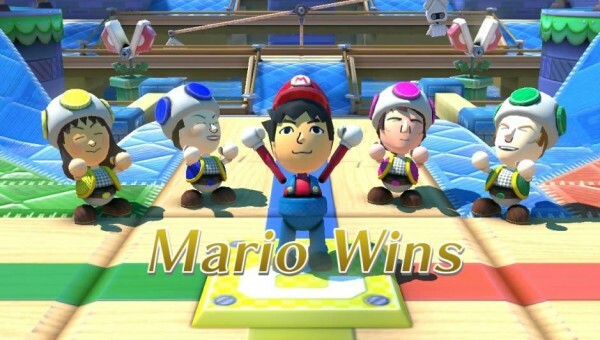 There is no single player option for Mario Chase, but there really doesn’t need to be. This game is a blast to play with friends and the only complaint I can even think of would be that there needs to be more stages. Animal Crossing: Sweet Day works in almost the same way, but has the players with the WiiMotes take control of animals as they try to gather up candies and deliver them to a set location. The Gamepad player must control two guards with the dual sticks and stop each animal before their delivery can be made. As the animals collect, their movement becomes slower, making them easier targets. Even with that light bit of strategy involved and the still solid controls, most are going to easily pass this one up after just a few rounds, as it’s just not as enjoyable as Chase or Luigi’s Ghost Mansion. Ghost Mansion is…well, just like the other two competitive games – essentially a hunt for one particular player. 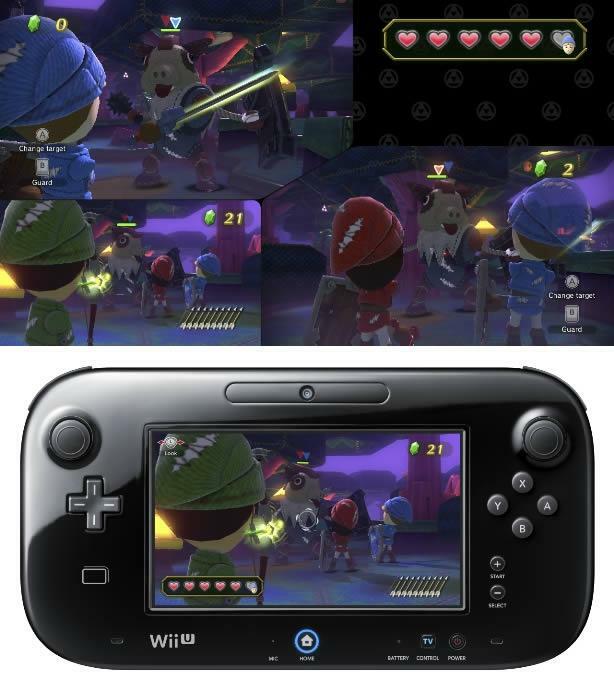 The Gamepad user plays as the ghost, while all other players have to hunt him down with their flashlights. If the ghost grabs the hunters three times, that player wins. If his HP gauge is drained to zero with the light however, the Luigis will become the victors. The ghost can not be seen on the television, so WiiMote users will have to pay attention to the vibrations in their controllers to track down the supernatural being. It’s solid, but the AI (when playing) seemed to just spin around in circles with their light, making the role of the ghost somewhat less entertaining as it is nearly impossible to grab a computer controller character. Also included is a good grouping of single player only titles. Takamaru’s Ninja Castle is that game we seen back at E3 in 2011, where players throw ninja stars via the Gamepad to attack ninjas and other targets. Captain Falcon’s Twister Race is a race to the finish, where players turn their Gamepad sideways to control Falcon via the Gyroscope, tilting the controller back and forth to take sharp turns and avoid obstacles throughout 12 consecutive areas. Yoshi’s Fruit Cart acts as a line drawing activity, where the player must draw a safe path for Yoshi to gather up fruit on the television with the Gamepad. Octopus Dance is based on that Game & Watch classic, and works a bit like Space Channel 5, where the player must mimic and then repeat dance moves by moving the controller in different directions. I know I am kind of speeding through those four as far as descriptions go, but there really isn’t a whole lot to any of the single player experiences other than a basic concept and simple progression. Donkey Kong’s Crash Course is a bit more complex, as it has the player use the gyroscopic control scheme to control a trolley along a themed – and quite large course. One wrong movement can cause the trolley to fall apart, so precision and accuracy is a must if the player wants to make it to the next checkpoint. Balloon Trip Breeze is the finest single player game on the disc, and worthy of a lot more attention. 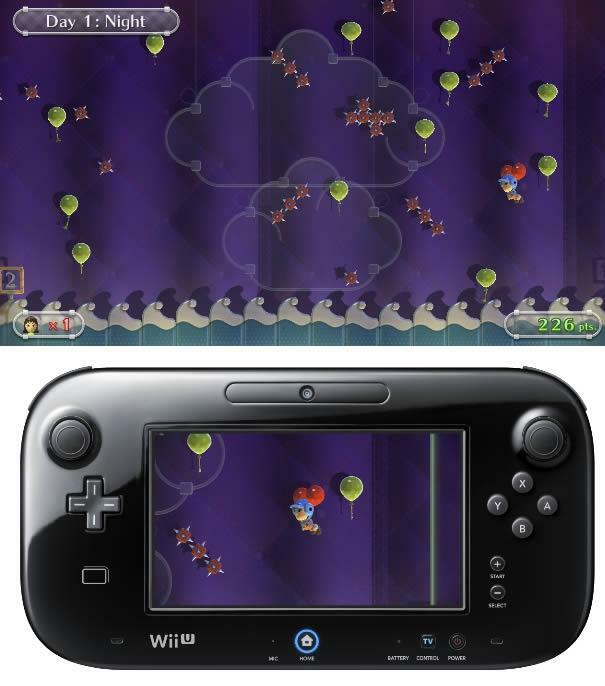 Based on Balloon Fight, this game has players swipe the screen with the stylus to control a flying Mii, blowing the Mii out of danger and into each balloon throughout a side-scrolling stage. As levels progress, the setting changes, and enemies and obstacles become more challenging to dodge overall. Balloon Trip Breeze is a relaxing bout if the player is simply wanting to just move forward, but proves it’s worth if you are wanting to snag every balloon on a stage. The Team attractions featured within Nintendo Land prove to be heavy hitters in the compilation , as there is a ton of content within each game. 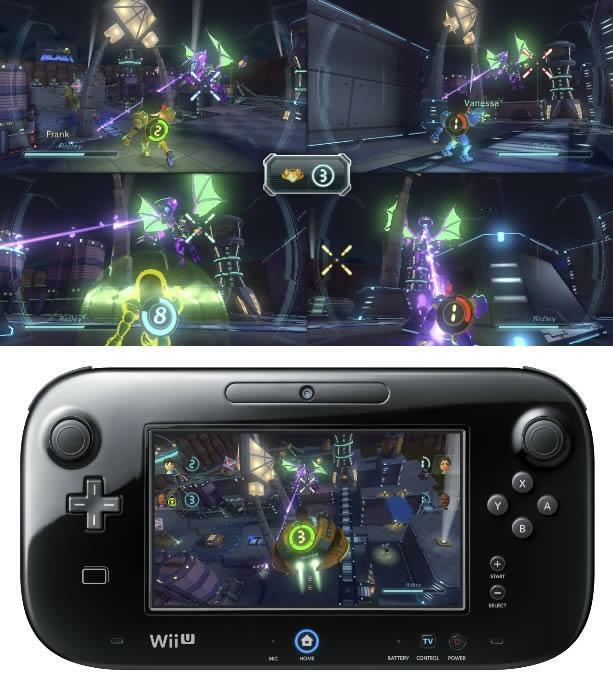 Metroid Blast plays a bit like a third person shooter when played with the WiiMote, letting your Samus-styled Mii take on waves of enemies and targets with a good number of the mascots abilities in tow. Of course this Samus has her (or his) own blaster, but also in tow is the morph ball and a charged bomb that can be tossed to take out multiple opponents. When utilizing the Gamepad, players take control of Samus’ ship, which uses a lot of features for the controller at once. The Gamepad can be moved in order to track a target, while the right analog controls how high (or low) the ship hovers. The blaster works about the same – as do the charged missile shots. Not only are all of these mechanics fluid, but they also make for one surprisingly exciting game as a whole. There are 20 levels in the main Assault mode alone (which can be completed in roughly two hours), and two other modes that feature different objectives afterwards -leading to the most fulfilling game included. Zelda fans are also in luck, as The Legend of Zelda: Battle Quest is also quite good. This title is an on-rails adventure, using two different methods of control. The Gamepad allows your Link inspired Mii set out and snipe enemies with his trusty bow. To aim, all that is needed is to move the controller in the direction of the enemy – and then flick (or hold and flick) the analog to fire at one of the enemies on screen. WiiMote users always stay a bit ahead of the archer, slashing enemies with swords in the same manner we seen with Skyward Sword. At the end of each stage, a boss makes an appearance that can be taken on solo or with a bit of teamwork. Teamwork is a big deal within the game as well, considering players share hearts and must work together to ensure every enemy is cleared. With 9 stages in all, fans of the series should be pleased with all of the love and enjoyable gameplay Battle Quest has to offer. Pikmin Adventure is one of my favorites in all of Nintendo Land – as it is very true to the core Pikmin experience. 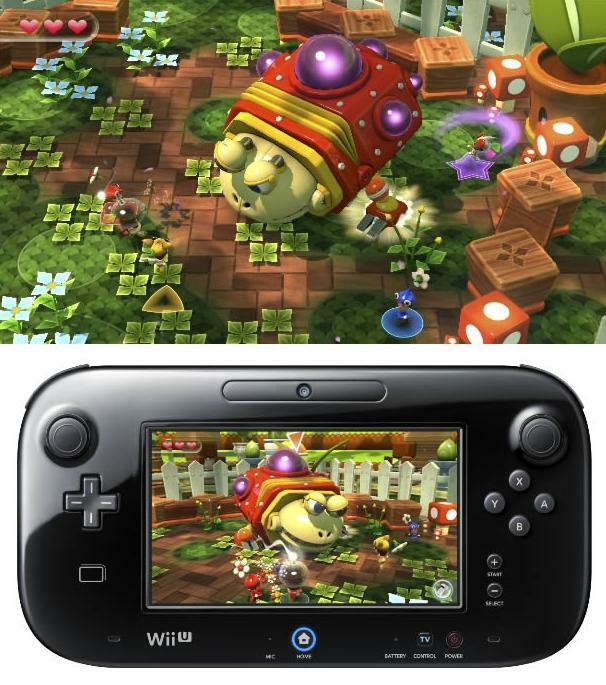 Players take control of Olimar with the Gamepad, and must explore the area to level up their Pikmin while sending their minions to attack enemies such as Bulborbs and other inspired foes and bosses. Items can be used to grant the Pikmin special abilities, and Olimar always stays fully involved with the ability to chuck rocks and bombs at enemies. If extra players join in, they can take the role of a Pikmin, and work with the AI to do Olimar’s dirty work. I know this isn’t the real deal – but if any of the games within Nintendo Land were to win an award for capturing the most charm from it’s IP, it would be Pikmin Adventure. Nothing is as charming as watching a Bulborb swallow up Olimar and turn him into a walking poo, and that kind of whimsical humor is what Nintendo Land seems to run on to keep all ages thoroughly entertained throughout. Once games are played, coins can be earned to participate in a Plinko mini-game – delivering gifts such as decorations and tunes for each stage completed. Each item earned for the park can be lightly interacted with, and add a great deal of incentive to continue playing so that your own park can become the ultimate Nintendo filled fest. There is also a train that circles the park that can be unlocked, which is a party mode and lets players go into several mini-games, one after another. 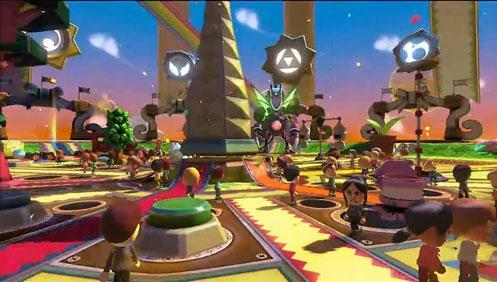 If connected to the Miiverse, other owners Miis will also begin roaming the park as well, making the hub area feel alive and full of activity at all times. Nintendo Land definitely shows off what the Wii U can do, but I will say that we now know the Wii U can do online, and this park would certainly benefit from more interaction with others. Sure, this game is a blast with friends by your side, but I feel it strongly benefit from an online mode. The visuals in Nintendo Land are absolutely superb. Being on of the first HD titles for the Wii U, Nintendo were smart to include so much color, as every attraction is just as fun to look at as it is to play. The art style is also unique on it’s own as well, as most attractions feature enemies, protagonists, and scenery that appear to be made of cloth, paper, and toys. Yeah, these characters may not look exactly like what you would find in a Mario or Zelda title, but the spirit of each game is very much alive, and fans are sure to spot all sorts of homages as they make their way through each attraction. In a brilliant move, Nintendo pulled most of the tunes for Nintendo Land straight out of their original counterparts. I won’t detail all of the classic tracks due to spoilers, but let’s just say there are plenty of songs that will make a Nintendo fanboy feel as if they were in paradise. The original tracks are all well done as well, keeping a festive vibe as players explore their park. Monita is in her own category. When I first booted the game up, I hated her passionately and wanted her dead. Never has a Nintendo character annoyed me so greatly just by speaking, and her constant urge to stalk the player throughout the park and every single game is something that felt like it was pulled straight out of a horror movie. As time went by, she started to grow on me though, as her writing is well done and every annoying quality of her character then seemed to be intentional. I guess I could say Monita will either be a love/hate mascot for most, but this dry humored robot is one that most will need to understand to properly enjoy. Nintendo put a lot into Nintendo Land, as it needed to not only serve as a tutorial for the Wii U’s gameplay methods, but also have enough content and quality games to warrant a purchase from the core crowd that Nintendo seem to want back in their own park – so to speak. This has been achieved. Nintendo Land is not a mini-game compilation, but instead a robust gathering of fully functional ideas that offer new ways to play with some of the greatest franchises of all time. Some games are better than others, but none are broken by any means and a good number feature enough content that they very well could have been sold as a separate product. Nintendo Land is a fully featured sneak peak as to what’s ahead for the Wii U, and if this compilation is any indication, we are in for yet another generation filled with innovation and magic – with those famous mascots leading us into the future. 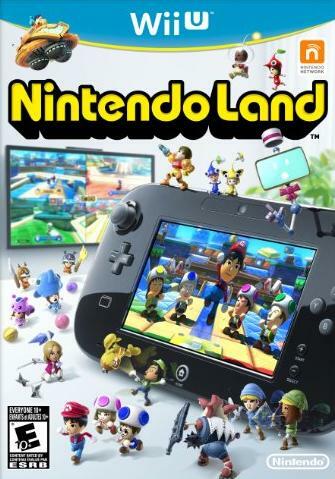 If you are a new Wii U owner, Nintendo Land is the first must have title to own, and one theme park that any Nintendo fan should be visiting.